Fencing is a modern art of combat sport, also known as Olympic fencing. 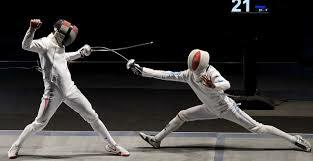 Two fencers face each other on a six-feet-by-40-feet strip with sword weapon and attempt to touch each other with the tip, Touches on the instrumented protective clothing are scored electrically. In this sport, three types of weapons can be used which are foil, epee and sabre (spelled "saber" in the United States), and the rules for each weapon differ in which parts of the body are valid targets, and the rules also differ of when a hit is scored. Many professional fencers all around the globe select to specialize in just one of these weapons. The foil is a light thrusting weapon (maximum weight 500 grams). The foil may target the torso (including the back), neck, and groin, but not the arms or legs. Touches are scored only with the tip; hits with the side of the blade do not count The epée is a thrusting weapon like the foil, but heavier (maximum weight 770 grams). In épée, the entire body is valid target. The sabre is a light cutting and thrusting weapon (maximum weight 500 grams). In sabre, the target is the entire body above the waist, except the weapon hand. Fencing is a sport at the Olympic Games, and one of only five sports which have been featured in every modern Olympic Games.